SLIS student and Project IDOL Fellow Jesse Lopez has been appointed to the 2016-2018 class of North Carolina State University Libraries Fellows. The fellowship begins in July 2016. The NCSU Libraries Fellows Program develops future leaders for academic libraries, with a focus on science, engineering, digital librarianship, diversity, and library management. For more than fifteen years, the program has attracted an impressive group of talented new graduates from universities throughout North America. NCSU Libraries Fellows are appointed for a two-year term as members of the library faculty, combining an assignment on an initiative of strategic importance with an appointment in a home department. Jesse Lopez is completing the Master of Library and Information Science at Wayne State University, with a certificate in Information Management. He has served as a Graduate Assistant at the Reference Desk, with Discovery Services, and in the School of Library and Information Science. 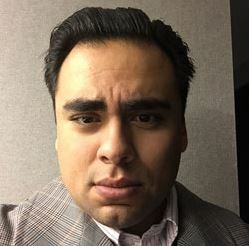 As an Archives Intern, he conducted primary source research for the “Ethnic Layers of Detroit Project,” Department of Anthropology, as part of an interdisciplinary project to document and share the complex layers of Detroit’s ethnic histories, cultures, and linguistics through an interactive digital storytelling web portal. Lopez was an Association of Research Libraries CEP (Career Enhancement Program) Fellow and a Project IDOL (Increasing Diversity of Libraries) Fellow. Before beginning graduate studies, Lopez served as a Linguist and Analyst with the United States Marine Corps. He holds the Bachelor of Arts in History from the University of California, Santa Barbara.